Serious critique deserves serious response. When several educators we respect wondered aloud on twitter about whether No Office Day sends a poor message about administrators, we took their reservations seriously. Upon further reflection, we still love #NoOfficeDay. For those not yet familiar with No Office Day, it is a day (or numerous days) on which principals and other school leaders shut our offices down and spend the entire day where learning happens – among our teachers and our students. Here are some of the original #NoOfficeDay principal posts that inspired the rest of us: No Office Day by David Truss, Be There by Lyn Hilt and International No Office Day by David Truss. Does No Office Day mean we never spend other time out of our office? Of course not! Effective principals are typically hard to find in their offices, because they are the “lead learners” of their building and are usually already in classrooms to observe learning. #NoOfficeDay days are part of more comprehensive approaches by principals to transform our roles from “experts” directing teachers and managing to full participants in learning, focusing the school on a culture of collaboration to support student learning. It is a day or several days in which principals immerse themselves into teaching in specific grade levels, certain subjects or throughout the building. It is time for principals to keep “in touch” with teaching and learning. No Office Day is merely one component of a more nuanced tapestry of the role of the principal and the way in which principals and other school leaders engage in learning. We each spend significant time daily in classrooms, not merely “driving by” as walkthroughs have been appropriately critiqued, but reshaping our roles to be more like coaches than evaluators. It is important to note that while we are out and about all the time many principals still end up spending large amounts of time in the office. Discipline referrals, parent meetings, scheduling, community partnerships, paperwork,etc. Some of these efforts are not “busywork” such as meeting with teachers on their professional learning goals and partnering with parents to support their children. Still, we’d be lying if we said we never got caught up in “busywork”. In some districts, it is more the norm for seasoned administrators to stay in their office and fill the role of manager as compared to instructional leader. No Office Day allows the opportunity to light a fire under some of these principals (and central office staff) who haven’t taught a day since leaving the classroom for administration. We can find No Office Day as more of a celebration of the great things we are doing (coaching, teaching, leading). Celebrating these things motivates those around us who may be set in their ways and have forgotten what it’s like to be in the trenches. It’s sad that that’s the case but its true. Last year many principals and central office staff (including superintendents) got involved and they had a blast. It really changed some of the mindset of administrators, resulting in regular No Office Days the rest of the year. While educators that are not principals may be critical of #NoOfficeDay, we realize that it is sometimes difficult for teachers to understand all the responsibilities that principals take on day to day. None of us realized how tough administrators have it…until we became one! Want to read more from other principals on #NoOfficeDay? You can find their posts here. I’ve recently come to embrace the idea that great principals and great teachers have at least three important habits in common. They have strong feedback loops for themselves, learning and growing professionally by incorporating feedback they receive. In 7 keys to effective feedback, an article in the most recent issue of Educational Leadership (Feedback for Learning: September, 2012; Vol. 70, No.1), Grant Wiggins writes: “the term feedback is often used to describe all kinds of comments made after the fact, including advice, praise, and evaluation. But none of these are feedback, strictly speaking. 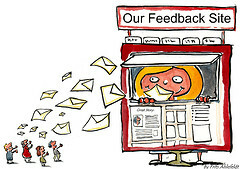 Basically, feedback is information about how we are doing in our efforts to reach a goal.” Wiggins then shares that helpful feedback is goal-referenced; tangible and transparent; actionable; user-friendly (specific and personalized); timely; ongoing; and consistent. Giving feedback is not easy for principals for a variety of reasons. There is the challenge of time. With 56 teachers in my school, and only one of me, offering feedback that is timely, ongoing, and consistent has been difficult. There is the challenge of experience. Most of us have given and been given advice, praise, or evaluative critique rather than feedback. And, perhaps most significantly, there is the challenge of role expectation. Principals, at least as I was trained years ago, have been viewed primarily as evaluators, giving “expert” advice and assessment, rather than sharing nonjudgmental observations with teachers for the purpose of professional learning and growth. Despite the inherent challenges, I have come to recognize that giving feedback effectively to teachers can be among the most significant contributions a principal can make to improving the quality of learning in our schools. So, how can principals overcome the challenges and offer effective feedback? For your feedback, I share the seven steps to effective feedback I am using. Step One: Schedule significant time be in classrooms. What is in our calendar gets done. It is difficult to offer effective feedback without having experience of learning and teaching, day in and day out, in our own schools. My own practice is to schedule two hours daily to be present in classrooms for learning and teaching; either observing or preferably engaging with learning in whatever ways teachers request. In addition to daily time in classrooms, I schedule six No Office days during the year, one with each grade K-5, on which I spend the entire day, from arrival to dismissal, with a grade. Teachers can assign me to do whatever they would like on these No Office Days. These days are valuable to me in assisting me to get a feel for the rhythm of the day in each grade. This year, as a birthday gift to each of our teachers, I will be teaching one period of their class on their birthdays. I also hope to cover for an hour on the birthdays of our other building administrators, office staff, and perhaps even our maintenance crew. Teachers and staff members can schedule the birthday class so that they can come late, leave early, extend lunch, or remain and watch me. (There is already a line of teachers hoping to observe me teach physical education, which should be a class filled with good spirit, humility, and laughter.) Teachers and staff members can also take a rain-check for another day at their convenience if their birthday is not on a school day or even if another day will simply work better for them. In addition to offering teachers and staff members the gift of time, which I wish I could do even more often, teaching each class will offer me perspective on the joys and challenges of learning and teaching in our school. Step Two: Schedule time for formal conversations with teachers to discuss professional learning goals, supports to reach goals, and to assess progress being made. This year I will be scheduling three formal meetings during the year with each of our faculty members. At the first meeting, taking place between September and November, we will set together a professional goal, an action plan to meet the goal, supports to reach the goal, and criteria for measuring progress and success. At the second meeting, scheduled between December and February, we will discuss progress toward the goal, confer on how supports are working, speak about whether feedback offered has been helpful, and make modifications as necessary. At the third meeting, taking place between March and the end of the academic year, we will reflect on professional growth during the year. Success will not be determined based on whether teachers meet their goal. There could be a goal easily met without much growth or a stretch goal, not met yet with enormous professional growth. Each teacher will fill out rubrics we created together as a faculty for our school’s Standards for Professional Practice. I will fill out the rubrics for each teacher to the best of my ability based on observations and conversations we have throughout the year. These rubrics are not only an assessment for teachers, but are also an assessment for me and my knowledge of learning and teaching in each classroom. I will leave blank what I cannot complete based on direct knowledge of learning and teaching in each class, thereby recognizing those areas about which I need to learn more. Each teacher and I will compare the rubrics and discuss. My notes on classroom visits will offer nonjudgmental feedback; phrased with the prompts we as a faculty have learned to use together on our learning walks in each other’s classrooms: I notice. I wonder. What if? How might? I will strive to connect feedback to each teacher’s professional learning goal. And, I will seek teachers’ input on what type of feedback and information will be most valuable to them as well as on whether the feedback I am offering is helpful. I have created a notebook in my very favorite app, Evernote, titled “teachers” and I have created a note for each of our teachers. I will add to the note after each of our formal meetings and after each classroom visit. Each time I add to a teacher’s note, I will send the the teacher a copy with the most recent additions at the top of the note. These notes will become a record of our ongoing reflective conversation and will take the place of a formal evaluative end of year write-up. Although utilizing Evernote to organize myself, I will focus on face to face interactions. I won’t bring my computer or Ipad into classrooms as teachers rightfully complained last year that I wrote on my Ipad in class rather than engaging in learning. I will carry my cell phone, primarily for emergencies during which my administrative assistant texts me. Having the phone with me does enable me to jot down a note if really worried I will forget. Generally, however, I remember what I want to write and record notes after students have left for the day. Some teachers write back to me, reflecting on feedback. Just as I have had meaningful conversations with colleagues in my professional learning network utilizing social media, I have had meaningful conversations with teachers in my school using e-mail. Other times teachers stop me in the halls or request time to speak to follow up on feedback offered and I love those ongoing face to face interactions. All teachers will have a minimum of three face to face conversations in which I focus my attention exclusively on their professional learning. While in classrooms, if I am not interrupting, I will share a compliment with each teacher on the spot. I recognize having a visitor in one’s class and hearing nothing can be disconcerting. Regardless of whether I can speak directly without interrupting, either in class or face to face afterward, I will share a compliment on something wonderful happening in the classroom along with the brief, written feedback I send. While I accept Grant Wiggins’ explanation that feedback and compliments are not the same thing, and I do strive to make a clear distinction, it is important to me to ensure that I compliment and show appreciation for our teachers regularly. I plan to function far more with a “coach’s hat” than an “evaluator’s hat”; yet if at any time I need to relay a concern as an evaluator, I will be direct in letting teachers know I have on my evaluator’s hat and am giving advice or clarifying expectations rather than sharing nonjudgemental feedback. It is vital for me not only to offer feedback, but also to receive feedback, opening myself to perspectives of teachers, staff members, parents, and students. I have thus sought to create a multitude of venues in which I request and strive to embrace feedback. As I share feedback with teachers, I simultaneously ask teachers for feedback. I was gratified when one of our new teachers shared that the two phrases she hears over and over are: How can we help you? And, give us feedback so we can do better. Our PTO provides valuable feedback from parents and I schedule parent-principal conferences on parent-teacher conference days and throughout the year, encouraging parents to speak with me directly. I continue to consider ways in which to receive feedback from teachers, other administrators, staff members, parents, and students. And, I will openly acknowledge, I appreciate the compliments I sometimes receive as well. In line with seeking feedback, I ask for your thoughts. What do you notice and wonder about these seven steps and about effective feedback more generally? What other considerations might be helpful? How might you adapt or improve upon these steps?